In our house it always seems that TV is the first go to on a rainy day. Now that we have moved to the Pacific Northwest, we have had to come up with some creative ideas to get the wiggles out on all of those rainy days. I always like to write about activities that adults can do because it is important for adults to model positive behavior for their children. All the exercise and moving around benefits you (the adult) and sets a good example. So get ready to be silly and have some fun! Getting out the rainy day wiggles…. 1. Make an exercise video. In the digital age, everyone has some sort of recording device. So set it up and create a workout video starring you and your kids. Teach them some new exercises and let them create their own. My kids were shown some exercises and then took some slight creative interpretation of them. 2. Watch some exercise videos that are designed for kids. In our house we have kiddie cartoon fitness videos on VHS and jazzercise on vinyl. It is not the most advanced of media, but it is fun and does the job. We also love Youtube for this reason. There are plenty of short exercise videos that you can watch for free! 3. Create an indoor obstacle course. Grab your pillows, buckets and anything else you can think of and create a fun-filled obstacle course. Try and see if you can find enough stuff to make a course throughout your entire house or make stations where you have to do some sort of activity at each stop. 4. Turn clean up into an exercise. Once clean up time starts, turn on some music and dance while you work to burn some extra calories and energy. This link also has some ideas on how to turn all household chores into exercises. 5. Have a dance party. Kids love to dance and dancing for 30 minutes can burn over 100 calories for the average person. Turn on your favorite online radio station to get some great, free dancing songs for kiddos. Our favorites are the “Hokey Pokey” and the “Chicken Dance” (not just for weddings anymore!). 6. Play an active game. I have been trying to stockpile as many “active” games as we can get our hands on. Our favorites are games like charades, but don’t forget about the ones that you don’t have to buy like limbo and musical chairs. For limbo, all we have is a broomstick and some music. 7. Create your own giant board game. To create ours, we simply cut some computer paper in half and wrote activities on each piece of paper. We rolled the dice and the person went that many steps and then did that activity. Fun and simple. Some activities were: hop 10 times, hula hoop, do 20 jumping jacks, etc. 8. Make “pick a card” exercises for indoors. It’s the same idea for outside, but can be catered to more indoor appropriate activities. For example, our outdoor cards have us running laps around the whole yard, so those would need to be taken out and can be exchanged for somersaults or jumping jacks. Each number on the card represents how many of that activity you or your family member has to do. 9. 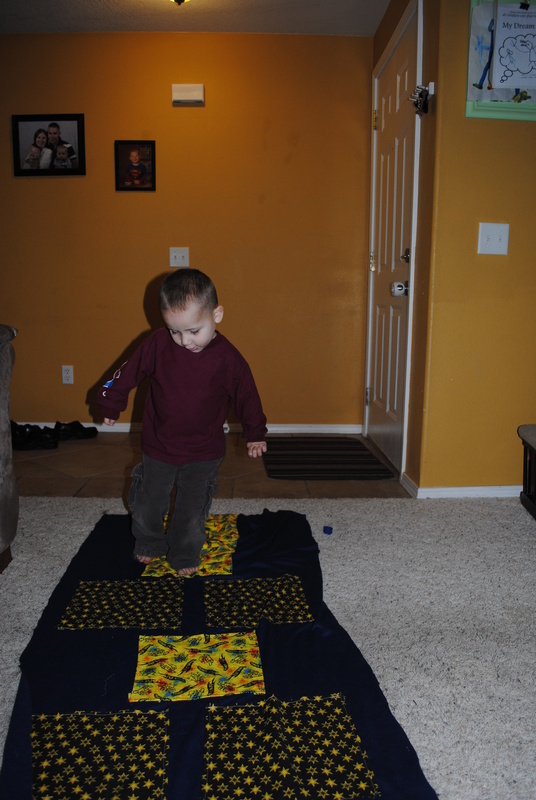 Make an indoor hopscotch using scotch tape. Make it as big as space allows and have fun. We made ours using random scraps of material from around the house. 10. Take a walk when the rain lets up. Every kid loves to jump in puddles, so bundle them up, throw on some rain boots and take them for a walk where they can do just that. Thanks! They are a lot of fun. Thanks for stopping by! I am glad you can use the ideas. 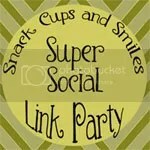 I will be happy to stop by again and get my other blogger friends to join. Thanks for hosting.